No headphone jack? No problem—or at least, not a problem that can’t be fixed with a solid adapter. Apple caused quite the commotion when it dropped the headphone jack from the iPhone 7, and kept it off the iPhone 8 and iPhone X. (The iPhone SE still has a headphone jack...for now, anyway.) This means that all your old headphones with a 3.5mm plug need an adapter. The iPhone 7 and 7 Plus have been out since September 2016, and some of us still struggle with headphone jack woes. But which adapter is right for you? 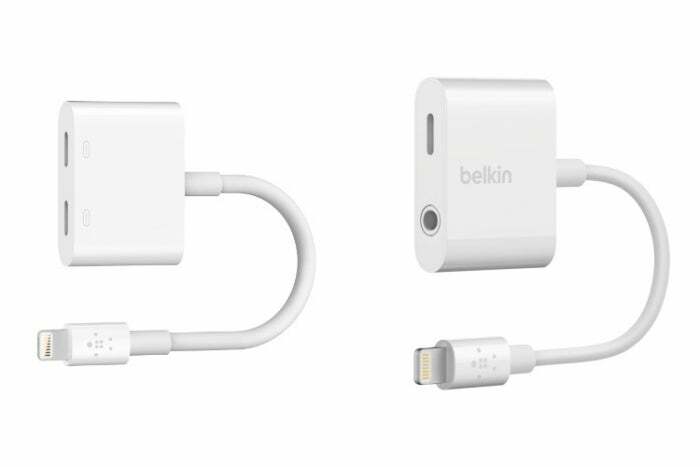 We've tried a bunch, and found Apple's solutions and Belkin's adapters the most solidly built and reliable. You can try saving a few bucks with a cheap third-party adapter from Amazon, but our results there were hit and miss. Read on to find out why. 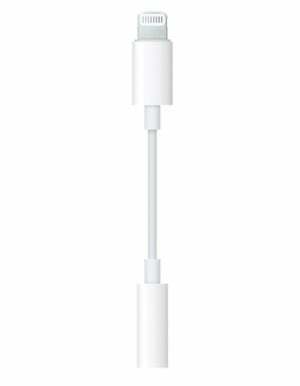 Apple saved itself from much of the outrage for getting rid of the headphone jack by including a Lightning to 3.5mm adapter free with every new iPhone since the iPhone 7. This adapter is so lightweight, you’ll hardly notice it hanging out at the end of your headphone cord. It’s also thin enough that it doesn’t get stuck in your pocket. 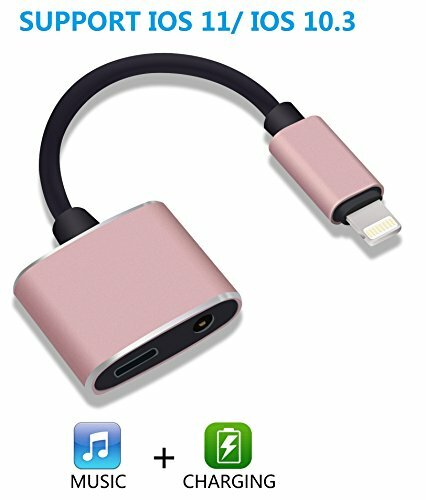 Best of all, you can replace this adapter for only $9, which is very affordable by Apple standards. 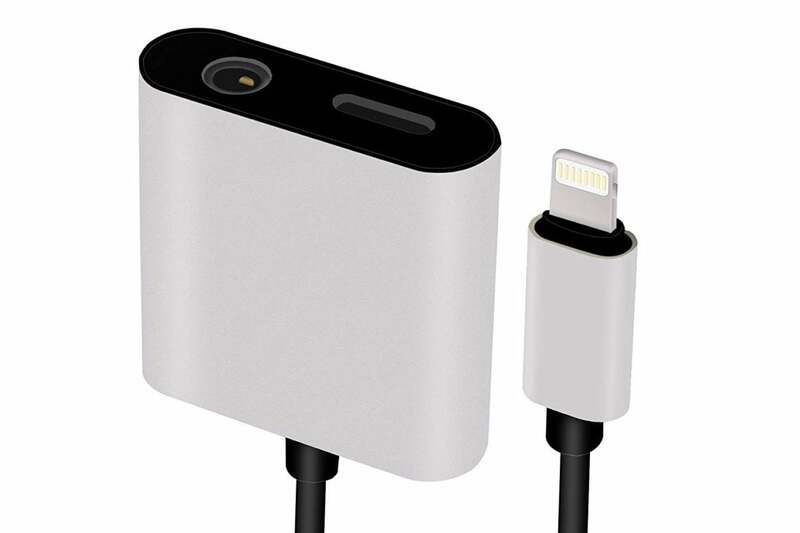 By comparison, when Apple switched from the old 30-pin connector to Lightning, the adapter cost $29, and it had to be purchased separately. Still, there are two problems with Apple’s in-box solution. First, it doesn’t have mic and audio control support for third-party headphones, so you can’t use the in-line mic and controls to talk to Siri, take a call, or skip a song. The second issue is that the single input means you can’t charge your iPhone and listen to music at the same time. When the iPhone 7 launched, Apple’s senior VP of marketing, Phil Schiller, personally shared his solution to the listen-or-charge dilemma: Use your AirPods, or get an iPhone Lightning Dock ($49). 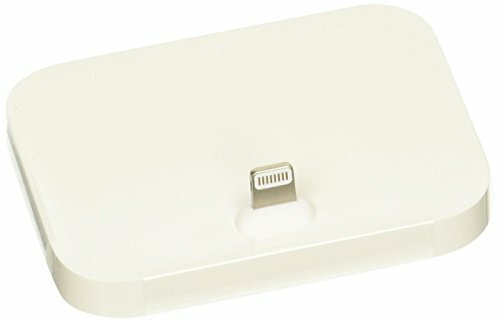 This Apple accessory lets you charge your iPhone by mounting it on the dock, and then you can use the spare 3.5mm plug on the back of the dock to listen to your headphones. 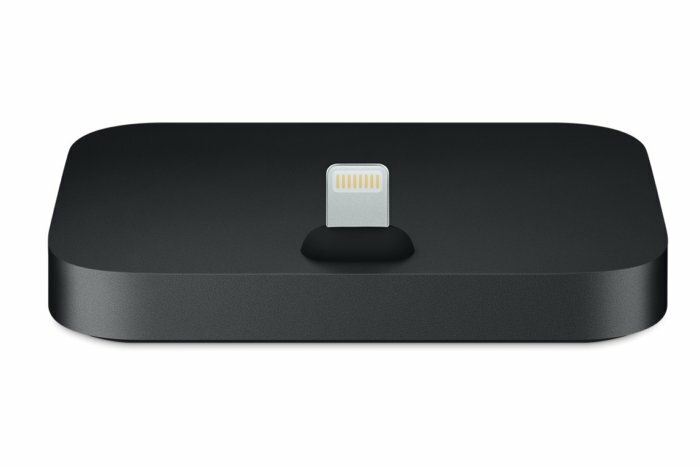 Apple still sells its Lightning Dock at full price, but Amazon has the previous version—which works exactly the same—for $38. 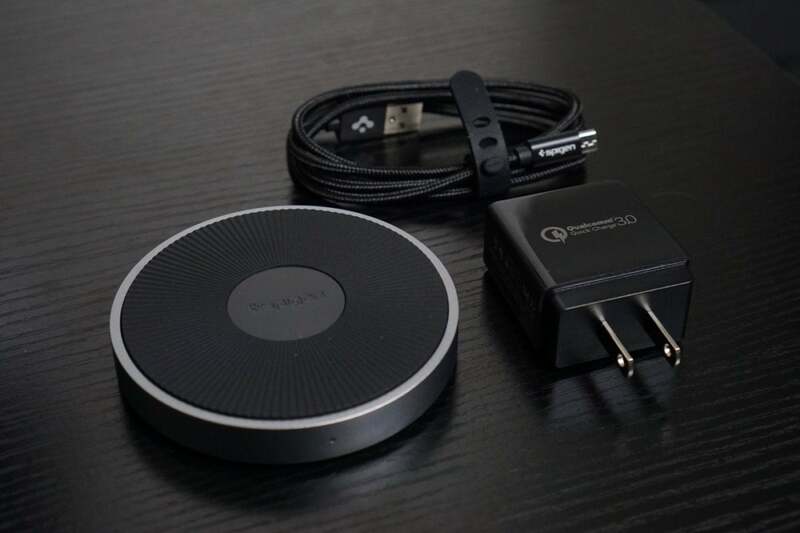 Another solution to the problem of listening while charging is to use a wireless charging pad, although that only works with the iPhone 8, 8 Plus, and iPhone X. Like the Lightning Dock, this isn't a mobile solution, since the charging pad needs to be plugged into the wall. And try not to bob your head too much if you're using wired headphones, or you could jostle your iPhone right off the charging pad. We've got a full roundup of wireless charging pads and stands for your perusal—the Spigen Essential F306W Fast Wireless Charger is our favorite. As of the time of writing, they're not in stock, but we contacted Spigen and a representative said they should be on sale again soon. This adapter takes a different approach: It uses Bluetooth to give wired headphones wireless capabilities. And unlike most traditional Lightning adapters, the $17 iTrip Clip also has a built-in mic so you can take calls or talk to Siri. 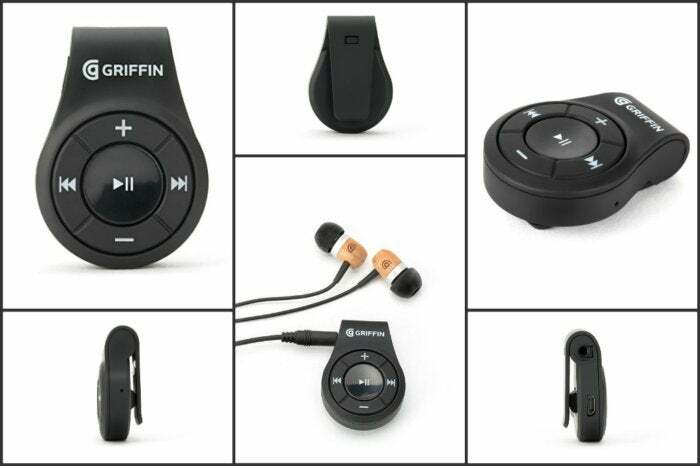 Plus, the iTrip Clip has another surprising functionality: Hook it up to your car’s stereo system using an AUX cable, and you can use Bluetooth to play music from your phone, just like that. 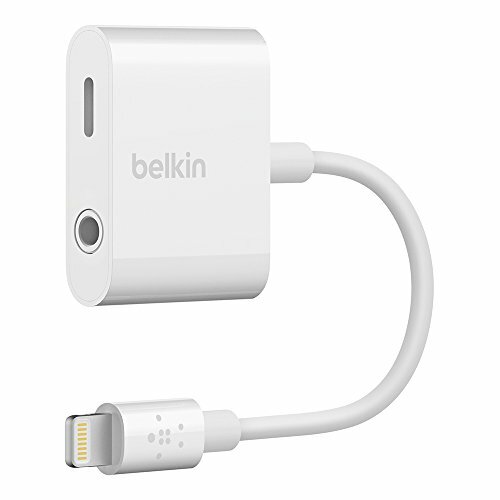 When the iPhone 7 launched, Belkin was one of the first accessory makers out of the gate with the $40 Lightning Audio + Charge Rockstar, but I found it needlessly clunky since it has two Lightning ports side-by-side. Sure, you can use the extra port for charging, but you still need an adapter for your 3.5mm headphones. 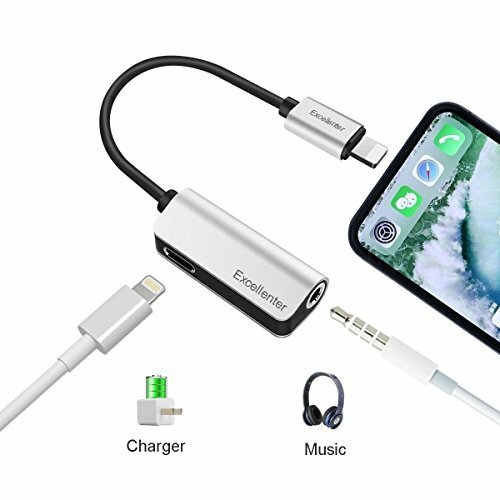 Luckily, Belkin now sells a 3.5mm Audio + Charge Rockstar ($34 on Amazon), which is still on the bulky side, but combines the two ports we need the most: a 3.5mm headphone jack for our headphones, and a Lightning port for charging. It even supports remote controls for MFi (Made for iPhone) 3.5mm headphones. 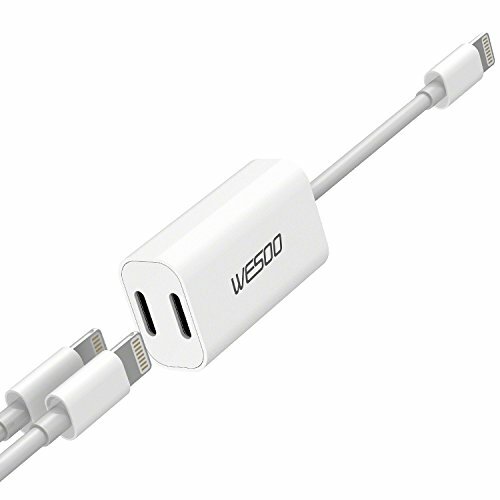 If you've got Lightning headphones, the Wesoo dual adapter ($16 on Amazon) works just fine. I was able to listen to music via Lightning earphones (and via 3.5mm earphones using the additional Apple adapter above), while simultaneously using the other Lightning jack to charge my iPhone. Besides being more affordable than Belkin's dual adapter, the Wesoo is also more compact: The dual Lightning ports are on top of each other rather than side by side, giving you just a little bit more room in your pocket. 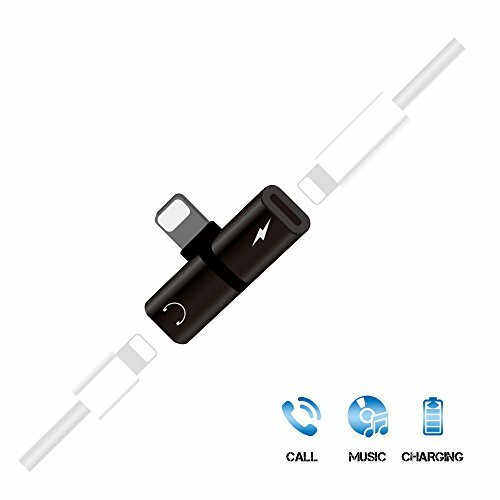 If you have Lightning earphones, give this adapter a try. It works with 3.5mm headphones, too, if you plug the earphones into Apple's Lightning adapter before you plug that into one of the Wesoo's dual ports. 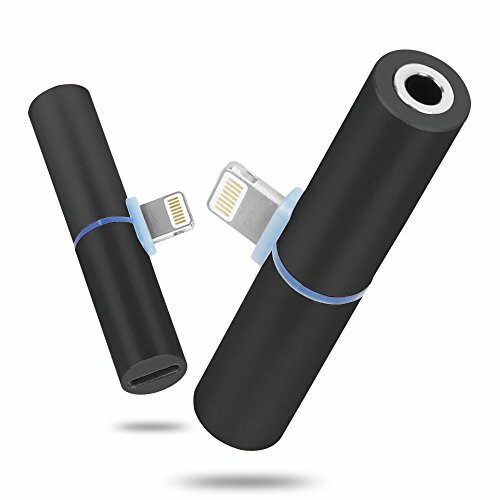 The Excellenter adapter has a space-saving design, putting the 3.5mm jack on the end of the dongle and the Lightning port on the side. It's weirdly long, though, as it hangs down a little more than 4.5 inches when it's plugged into your iPhone. Charging with a Lightning cable while I listened to music on 3.5mm headphones worked just fine, but unfortunately, the inline controls on my headphones didn't work. Still, if you don't mind that limitation, this is a good deal for $15 on Amazon. From here the quality drops off pretty sharply. 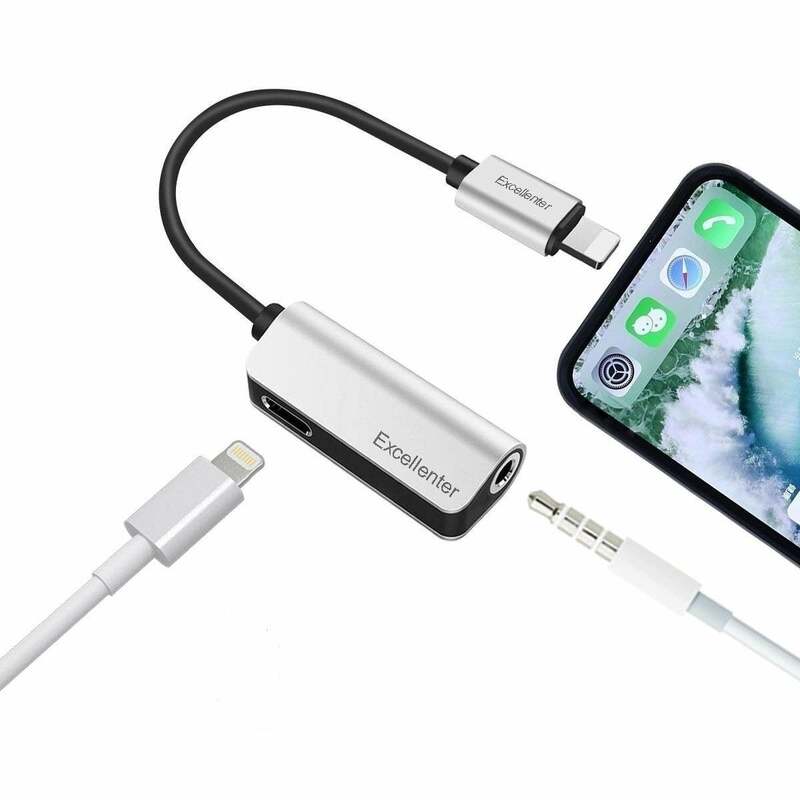 ElementDigital's compact, barrel-shaped adapter ($13 on Amazon) extends just half an inch from the bottom of your iPhone, giving you a Lightning port on one side for charging and a 3.5mm port on the other side for your headphones. The charging port worked fine in my tests, and when I connected a Lightning cable to charge, the adapter lit up blue for a visual cue that the electrons were flowing. But the headphone jack was a bit of a bummer. I tested with multiple sets of wired headphones and heard audio cracking in all of them. In order to get rid of it, I had to carefully fiddle with the headphone jack, turning it until I found the sweet spot. 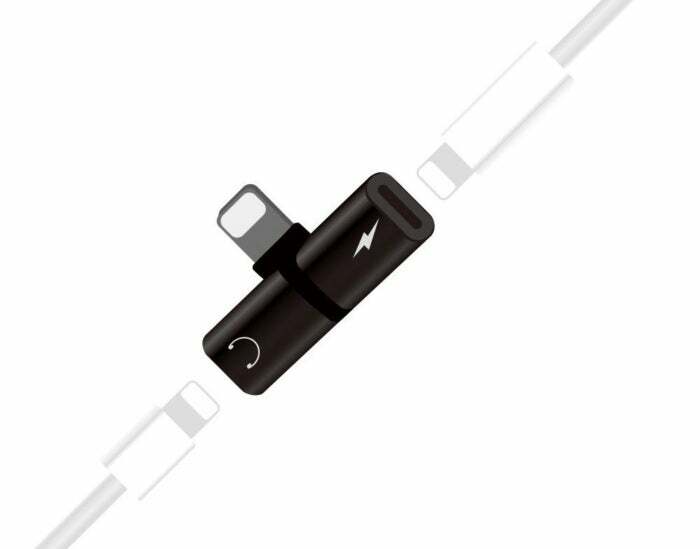 The H.Guard dual adapter costs just $14, and it comes with one Lightning port and one 3.5mm headphone jack. Charging and playing music worked just fine in my tests. Sadly, it delivered an iffy experience when I tried using the inline controls on my 3.5mm headphones. Pressing the Play/Pause button worked, but the volume controls often didn't. If you never use your headphones' inline controls, though, this is a bargain. 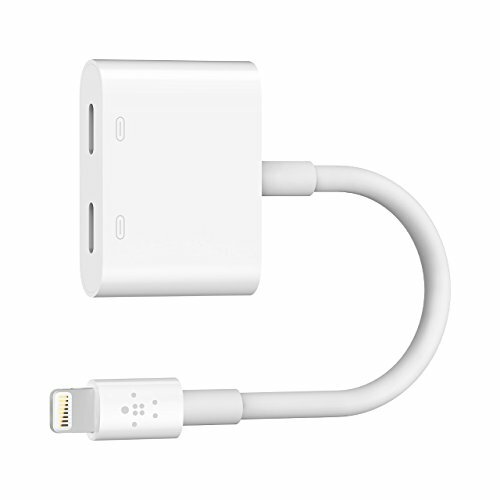 Tessin's $17 dual-Lightning port adapter has the same barrel shape as the ElementDigital adapter, just with Lightning ports on either side rather than one Lightning and one 3.5mm port. 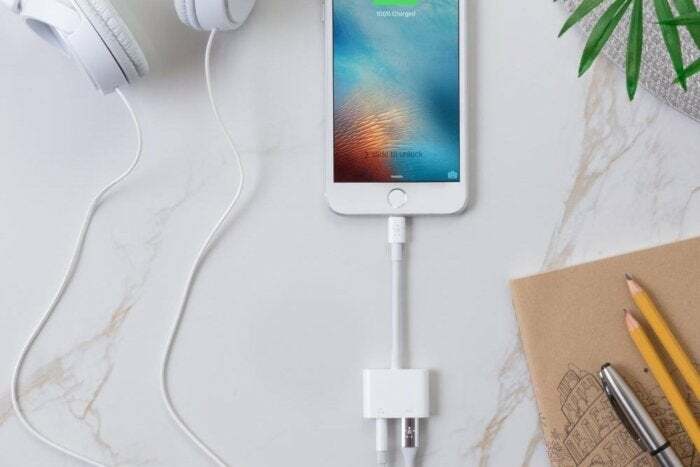 Once you plug it in to your iPhone, you can connect Lightning headphones on one side and a Lightning charging cable on the other—the ports are labeled so you can tell them apart. At first I got excited, because the port labeled with the headphones symbol worked well with the Lightning EarPods that Apple ships with the iPhone, as well as with my favorite 3.5mm headphones plugged into Apple's Lightning to 3.5mm adapter. When I used Apple's adapter along with the Tessin, all the inline controls on my headphones worked too. Unfortunately, the charging port on my unit doesn't work at all. Lightning headphones plugged into it won't play. Lightning cables plugged into it don't charge the iPhone. The port itself even feels off—you have to push and pull a lot harder than you should to connect and disconnect a cable. Because it's so cheap, I'll order another one and see if it's a design problem or if I just got a crappy unit. This fun little gizmo isn't an adapter at all—but it's a way to keep your Apple adapter handy. 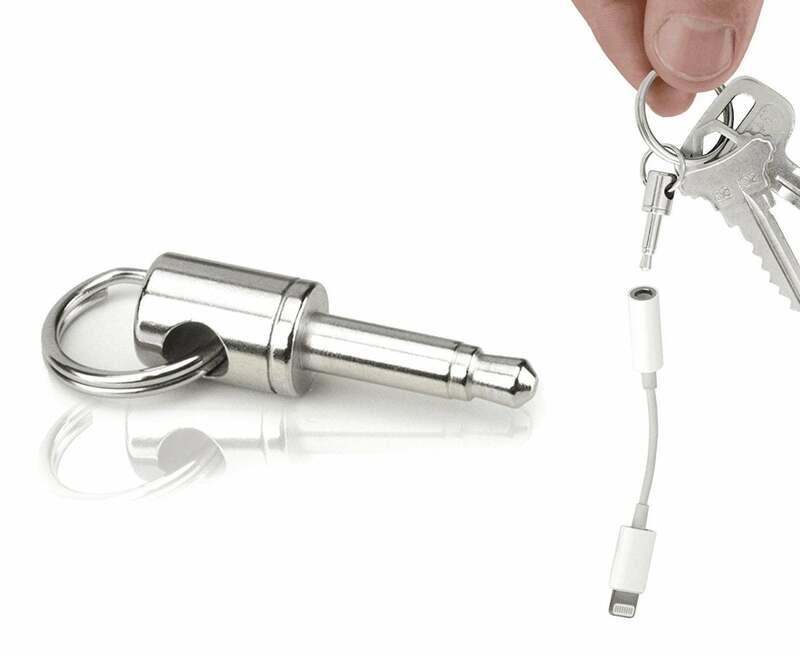 The Dongle Dangler is simply a headphone plug attached to a keyring. 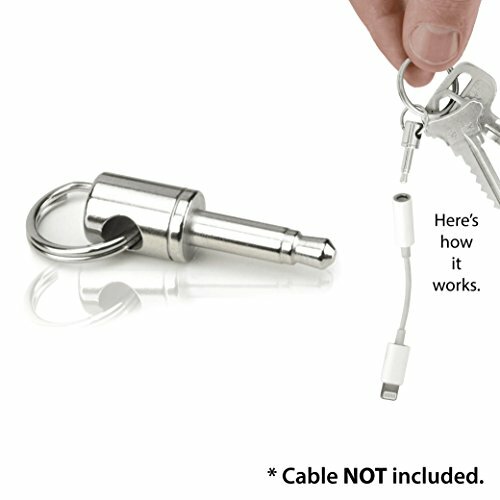 You stick the plug into the 3.5mm port on Apple's adapter, or any other adapter with a 3.5mm jack, and that lets you attach it to your keyring so you always have it when you need it. Even if you use Bluetooth headphones most of the time, the Dongle Dangler could come in handy. 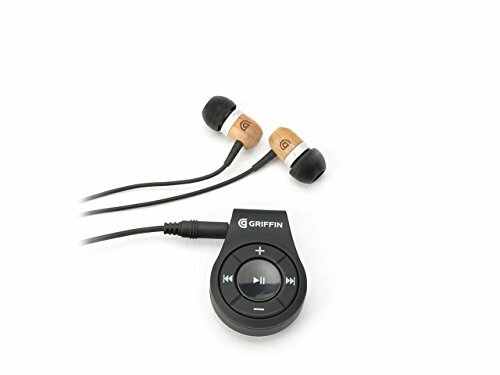 Have you ever forgotten your Bluetooth 'buds, or had them die on you, and you wanted to duck into a drugstore to pick up a very cheap set of headphones so you don't have to commute in silence, only to kick yourself when you realize you have no way of plugging said cheap headphones into your iPhone? An adapter swinging from your keychain on the Dongle Dangler would solve that (admittedly very first-world) problem.